High in the Troödos Montains on the beautiful island of Cyprus nestles the Kykkos monastery. 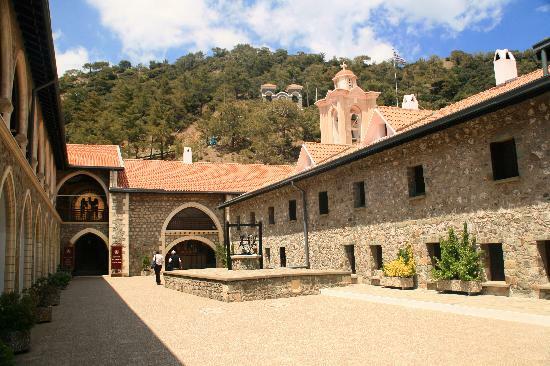 The monastery is famous because the first President of Cyprus, Archbishop Makarios III started his ecclesiastical career there as a monk in 1926, and his tomb lies reasonably close by. 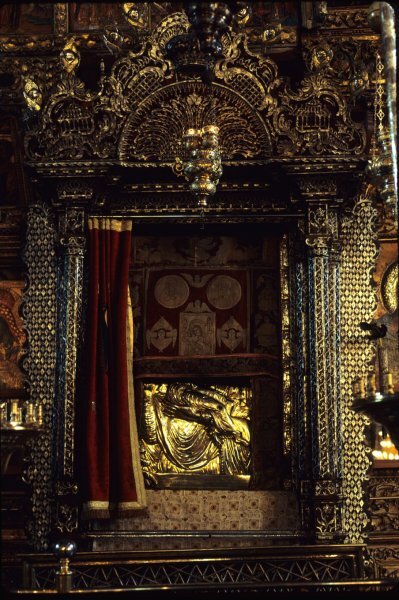 But the other reason that the monastery is famous is because it is custodian of an icon of the Blessed Virgin Mary. The icon is rarely looked at, and the majority of the time it is hidden away behind a solid silver covering which in turn is an accurate representation (it is said) of what lies beneath. The icon is worth a mention today because tradition says was written by St Luke. St Luke, who many know as a doctor from what little we know of him in the New Testament, tradition says was also the first icon writer. In both what he wrote in the Gospel that bears his name and his second book, Acts, and in the icons he traditionally has attributed to him, Luke’s purpose is clearly to paint picture of what God has done in and through Jesus. Art is a very subjective thing. Many of us like this or that picture because it is beautiful, but for many of the greatest artists, art is not about beauty but about stirring something within us, eliciting a response, drawing us into a conversation about ourselves, our culture, our world and it’s values. I was at the Royal Academy of Friday to see the Ai Weiwei exhibition there. One piece, simply called ‘Straight’ commemorates an earthquake in his native China where 5000 women, men and children all died because of the flimsy nature of many buildings. The artwork is a 90 tonne carpet of steel rods of varying heights made of the buildings that were destroyed plus the names of the dead written in Cantonese on large panels. Some might argue that it’s not traditionally beautiful, but it is deeply moving and even though steel is strong, it reminds us of life’s fragility. Jesus said, ‘…Whenever you enter a town and its people welcome you, eat what is set before you; cure the sick who are there, and say to them, “The kingdom of God has come near to you…’ Since His birth, the ministry of Jesus has been about bringing the authority, power, presence and love of God near to the unlikely and to the often supposedly undeserving, and seeing lives transformed, reordered, and healed. But what is clear from what we hear this morning - that task was never destined to be his alone, but something he called others to share in too. Last week the church and our nation remembered the life of Edith Cavell a British nurse and committed Anglican Christian, who during WW1 helped care for both German and Allied casualties alike, but who was ultimately shot for aiding nearly 200 Allied troops to escape occupied Belgium. She understood the duel call in this morning’s Gospel to heal the sick but also to see the nearness of the kingdom of God to all when she said, ‘…Patriotism is not enough. I must have no hatred or bitterness towards anyone…’ - a rejection of patriotic hatred which so often can fuel war, instead her compassionate faith shining through. She was given a State funeral and was subsequently buried outside Norwich Cathedral in 1919. As we remember St Luke today, and seek healing in our own lives, how do we share that which we have received with others and our wider community? How are we to record, write and paint the life of Christ in our own lives so that others, as Luke says, ‘… may know the truth concerning the things about which you have been instructed…’?